Knee synovitis occurs when the synovial membrane which lines and lubricates the knee joint, becomes inflamed. 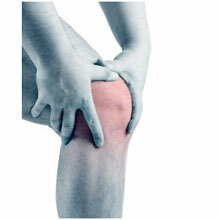 Swelling or stiffness in the knee joint may develop following another injury or from arthritis or gout. The treatment of this knee injury depends on the underlying cause of the condition. Symptoms include pain and swelling with stiffness in the knee joint. There will be an increased skin temperature and redness over the area. When a patient presents with suspected synovitis, they may be referred for scans such as an MRI, and fluid may be taken from the knee and sent for testing. Knee synovitis occurs when the synovial membrane which lines and lubricates the knee joint, becomes inflamed. Synovitis may be caused by another condition, such as rheumatoid arthritis or gout, or may develop on its own. All of the large joints in the body (such as the knee, hip, and shoulder) are synovial joints. These joints are surrounded by a synovial membrane which encapsulates the joint and lubricates it by secreting synovial fluid. This lining can become inflamed, causing pain and stiffness in the joint. Synovitis is usually a secondary condition, caused by another ailment, such as arthritis. It may also be caused by an injury to the knee joint or cancer. For this reason, it is important that suspected cases of synovitis are investigated thoroughly. Treatment depends on the cause of the synovitis. If it is an injury, then the RICE principle of rest, ice, compression, and elevation should be applied and this is usually effective. If the cause is arthritic, then anti-inflammatory medications are usually successful. In cases caused by more serious conditions, treatment of that condition is the primary concern, although arthroscopic surgery may be performed to remove the affected synovial tissue. This form of synovitis is a more serious condition, which results in an overgrowth of the synovial membrane, resulting in a benign tumor. Pigmented Villonodular Synovitis most frequently affects the knee and hip joints. Symptoms of PVNS include episodes of pain and swelling which comes and go with rapid swelling. Pain will gradually get worse with the knee joint sometimes catching or locking. If not treated early, pigmented villonodular synovitis may spread to other tissues. If suspected, an MRI scan should be ordered and synovial fluid drained from the knee for testing. A biopsy may also be taken to confirm the diagnosis. Treatment usually involves removal of the tumor, via a synovectomy, to remove the affected lining. Approximately 45% of cases reoccur, and so radiation therapy may also be used. In repeating cases, a full knee replacement operation may be advised.